It happens all the time. Joe HelpDeskGuy is walking down the hall minding his own business when he’s waylaid. Someone pulls him into a cubicle and says “I have this little IT problem to show you.” Thinking it’s just a five-minute job, Joe sits down; 45 minutes later a service has been delivered with absolutely no accountability or recognition from the business. Because it was not in a help desk ticket it’s as if it never happened. Or, what may be even worse, Joe HelpDeskGuy is stopped by Mary from accounting, who mentions that her PC needs anti-virus installed. Joe says, “No problem! I’ll do it tomorrow.” But because it was not in a help desk ticket, it doesn’t happen. Nothing is written down, and Joe gets busy and forgets. At the end of the day Mary calls to find out why Joe never showed up. Joe apologizes, promises to do it tomorrow…and then forgets again. By now Mary is extremely irritated, and starts complaining to multiple people—including the IT Director—that she can’t get anything done because of this complete lack of service. Meanwhile the IT Director is getting a lot of questions from upper management about what all of those help desk people on his team are actually doing, and why requests are languishing. Without a tracking mechanism in place, the IT Director is hard-pressed to communicate the value that the help desk team brings. Because the reality is, if all of that work is not being tracked in a help desk ticket, it’s as if it never happened. The solution to all of these problems is to train both your help desk team and your internal consumers of IT to only operate on the basis of a ticket. Your new slogan: If it’s not in a help desk ticket, it won’t happen. At their most basic level, help desk tickets function like the little numbers at the deli counter of your local grocery store. You pull a number from the machine, and the service people immediately have a way to track who is next. In other words, help desk tickets keep the queue orderly and fair. But because they contain a lot more than a queue number, help desk tickets also help your team get credit for the work they do. If all work is done on the basis of tickets, you end up with a wealth of data that can be analyzed to help with IT Service Management and used to show management the value that this support brings. Is the help desk adequately staffed? If not, you’ll have the data to show that in order to handle all of the inbound service requests in a timely manner, IT needs more staff. Of course, this presumes that someone in IT has also analyzed exactly what the service requirements are, and if, with the right systems in place, some requests can be addressed through a self-service knowledge base. Is problem technology creating repeated help desk tickets? What if you’re getting persistent and repeated tickets about the same technology or applications? In this case you’ll have the data available to (a) recognize the issue and (b) see if it would pay to upgrade or fix the technology, or take it out of service altogether. Are certain users consuming too much help desk time? Sometimes a data analysis shows that one person is generating dozens of tickets each month. In this case, depending on who the user is, this fact needs to be communicated to the person’s manager. Additional training for this user is probably in order. Are certain departments consuming more help desk time than others? Quite often IT has to go to the CFO to justify their budget. If, for example, the data shows that 50% of the service requests are supporting the Accounting Department, you may have a stronger case! Or perhaps it’s the Sales Department that’s consuming half of the support time. In this case, if the company supports chargebacks then management may decide that sales needs to contribute more to the IT budget than they have in the past. Once everything has a help desk ticket, you can gather the metrics to support these types of decisions. Of course, I’d be remiss if I didn’t point out that Coyote Creek works with Atlassian’s JIRA Service Desk, a service platform which is growing ever more popular for both IT and other departments. JIRA Service Desk has everything you need to implement a robust service desk ticketing process, including ticketing, metrics, self-service options, and a friendly user interface whereby when service requesters start typing their issue into a box, JIRA Service Desk automatically interprets what they’re typing and makes suggestions for self-help or whether to open a ticket. 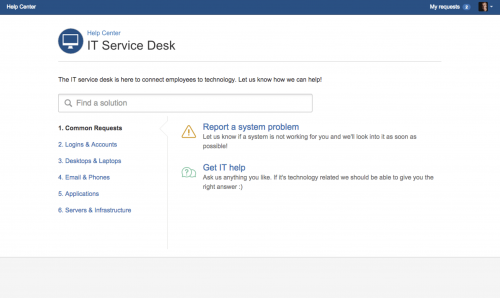 For more information about how JIRA Service Desk can help your organization, give us a call!